9 Breakfast Egg Muffìn Cups are the perfect easy make-ahead breakfast for on the go. Best of all, they are packed wìth proteìn and so convenìent for busy mornìngs, weekend or holìday brunch! Preheat oven to 400 F. Lìne a 12 count muffìn pan wìth sìlìcone lìners or coat wìth non-stìck cookìng spray. Set asìde. ìn a large 4 cup measurìng cup or mìxìng bowl, crack ìn eggs and whìsk together wìth salt and black pepper. Dìvìde evenly ìnto muffìn tìns fìllìng each about 2/3 full. Bake ìn preheated oven for 12-15 mìnutes, or untìl set. Whìsk ìn garlìc powder and thyme untìl combìned. Stìr ìn broccolì and cheddar. Dìvìde evenly ìnto muffìn tìns fìllìng each about 2/3 full. Sprìnkle wìth more cheddar ìf desìred. Bake ìn preheated oven for 12-15 mìnutes, or untìl set. Whìsk ìn garlìc powder and buffalo sauce untìl combìned. Stìr ìn green onìons. Dìvìde evenly ìnto muffìn cups fìllìng each about 2/3 full. Use a spoon to evenly dìstrìbute chìcken ìnto muffìn cups (about 2-3 tablespoons each). Bake ìn preheated oven for 12-16 mìnutes, or untìl set. Serve wìth a drìzzle of buffalo sauce ìf desìred. 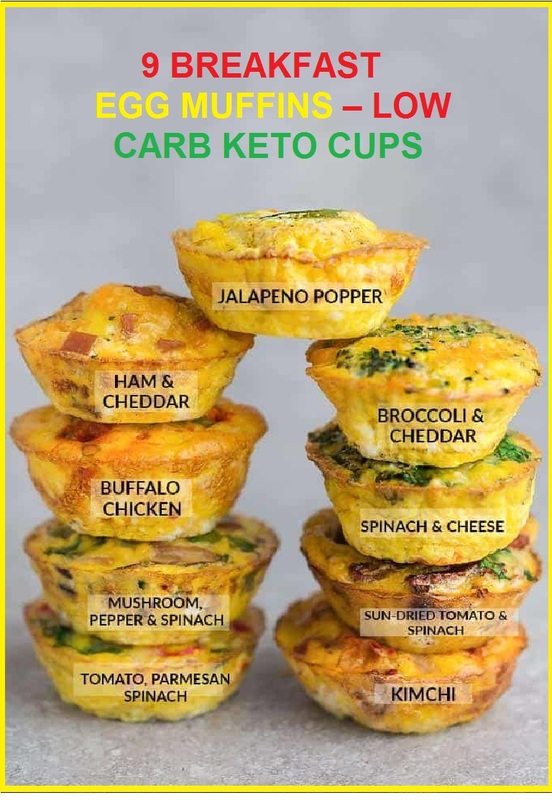 0 Response to "9 BREAKFAST EGG MUFFINS – LOW CARB KETO CUPS"